(AP) PIEDRAS NEGRAS, Mexico - Officials said Tuesday they have found three inmates thought to have escaped through a tunnel at a northern Mexico border prison, lowering the number of escaped prisoners to 129. Three female inmates were found hiding in a prison visiting area, Jorge Luis Moran, the public safety secretary of the northern border state of Coahuila, told the television network Televisa. 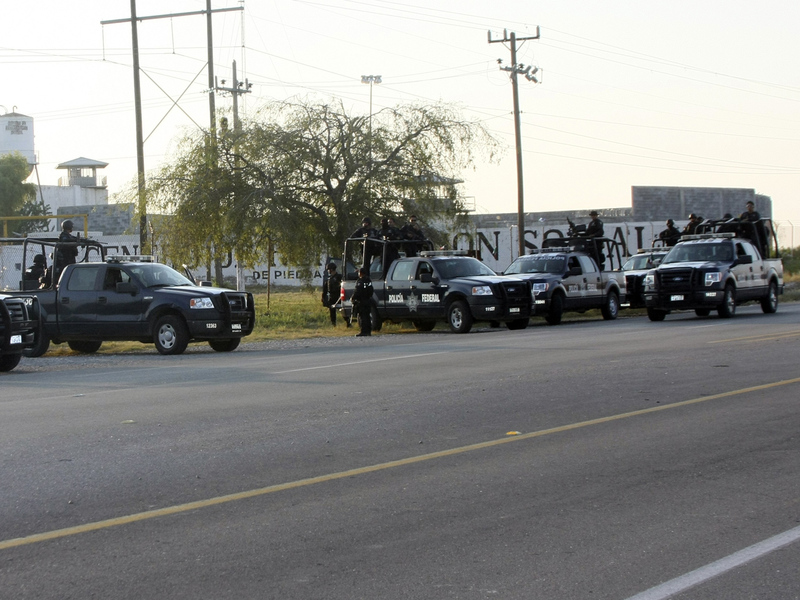 Federal police units and Mexican troops, including 70 members of an elite military special forces unit, are searching for inmates who fled the prison in Piedras Negras, a city across the border from Eagle Pass, Texas. They escaped through a tunnel 21 feet long and 4 feet in diameter on Monday and then cut their way through a chain link barrier and escaped onto a neighboring property. The director and two other employees of the state prison have been detained for an investigation, and President Felipe Calderon called the jailbreak "deplorable" in a statement posted on his Twitter account Tuesday. Calderon appeared to re-ignite the long-running dispute between federal and state authorities, writing that "the vulnerability of state law enforcement institutions must be corrected." Collusion between guards and drug gangs has played a role in past escapes, and federal authorities have been pushing to have all state and municipal police and law enforcement officials submit to background and anti-drug checks, as well as vetting for possible links to organized crime. But state authorities have been dragging their feet. On Monday, federal Interior Secretary Alejandro Poire said that only 180,000 of the country's 430,000 city and state police have been vetted and checked, and that about 65,000 of those tested had failed the tests. That failure rate  about one-third of officers  has been a constant problem in the testing program, which is supposed to conclude with all officers vetted by early 2013. That goal now appears unreachable, and the question remains of what will be done with the officers who failed. All are supposed to be fired, but Mexican labor laws and a shortage of recruits to replace them makes it an arduous process. In February, nine guards at a prison near the northern city of Monterrey confessed to helping 30 Zetas drug gangsters escape. But not only did the Zetas flee; during the jailbreak, other Zetas slaughtered 44 inmates who belonged to the rival Gulf cartel. In December 2010, 153 inmates escaped from a prison in the northern city of Nuevo Laredo, right across Laredo, Texas. Authorities charged 41 guards with aiding the inmates in that escape. State authorities counter that their relatively low-security prisons are forced to hold dangerous inmates being held on federal charges like drug trafficking and organized crime. The prison houses about 730 inmates and the escape represented almost a fifth of its population. Coahuila Attorney General Homero Ramos said 86 of the escaped inmates were serving sentences or awaiting verdicts for federal crimes, such as drug trafficking, and the rest faced state charges. The tunnel "was not made today. It had been there for months," Ramos told the Milenio TV station. Authorities say they also found ropes and electric cables they believe were used in the break.